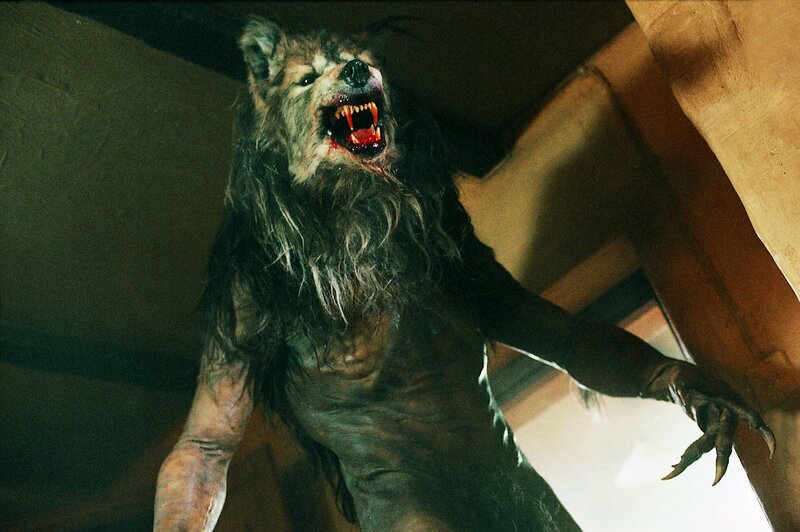 If Dog Soldiers was a mammal, it would be a vampire bat – scary, hairy, full of blood, and yet you cannot take your eyes off of it. It is arguably one of the most gratuitously violent, and under-certified films on the U.K. market (The Untouchables 1987)) also springs to mind as Both are rated Fifteen). Perhaps the British Board of Film Classification should have granted this film an Eighteen certificate, like their Irish counterparts. The story begins with a military training exercise set in the wilderness that is the Scottish Highlands (despite actually being filmed in Norway). What seems to be a staged combat scenario between Army Infantry and Special Ops, is disrupted by a furry third party. After a hair-raising initial contact, Sean Pertwee (Love, Honour and Obey (2000)) leads a team of survivors to take refuge in a seemingly vacant cottage. It is here that the rest of the pieces fall in to place. A midst a hail of gunfire and drool, the characters are well-developed to a degree not usually seen in traditional horror-fests. The film incorporates a wonderfully written and typically British script, but does include certain slang terms (“claret”, “brew” and “bone”) which could alienate potential viewers across the pond. Between consistent references to folklore and football however, a natural British feel emerges. A montage of well-deployed camera angles and overcast lighting is used throughout, adding to the feeling of tension. The opportunism of the characters during scenes of confrontation is refreshing in films of this type. For instance, the use of boiling water and aerosols as weapons would please even the most critical “if that was me…” viewer. On the negative side, the werewolves appear more The Littlest Hobo (1979) than Lycanthrope and seem to have more hair than Chewbacca’s hairbrush. Also, the performances of a couple of the cast seem more wooden than the endless supply of planks used throughout the siege scenario. On a shoestring budget of around £3 million however, this is to be expected. The film also incorporates a dark comedic backbone throughout, portrayed through one-liners, small talk and petty insults. This black humour, coupled with colloquialisms also add to the sense that this is a film produced for a predominantly British audience. Along with 28 Days Later (2002), The Descent (2005) and Creep (2004), Dog Soldiers proves to be a refreshing addition to the British horror movie industry. All in all, a fun watch. Performance of the film – This film was never going to win Oscars for acting, despite convincing performances from Pertwee and Mckidd ( Trainspotting (1996)). Pertwee sneaks it by a whisker. Quote of the film – Despite a plethora of one liners, Emma Cleasby’s “It’s that time of the month” stands out. Fact of the Film – Alongside his diverse acting career, Kevin Mckidd has provided the voice for ‘Soap MacTavish’ in the hugely popular computer games franchise Call of Duty: Modern Warfare. Soundtrack/Score – No real soundtrack, but a catchy score from Mark Thomas had us humming for a while. Some cheesy one-liners, but a very dogged effort. A good horror film – rarer than a steak tartar. 82/100. Posted on 13/09/2012, in action, D, Entertainment, Film, Horror, Movies and tagged British Board of Film Classification, Dog Soldiers, Emma Cleasby, John MacTavish, Kevin Mckidd, Littlest Hobo, Scottish Highlands, Sean Pertwee. Bookmark the permalink. Leave a comment.